– OR GET IT FREE when you order BeHappy! (also FREE) above. They allow themselves to "fail boldly"
They don't wait to act. The previous edition of The BeHappy! Newsletter was about setting goals. And, since it was the “New Year” edition of the newsletter, it distinguished between goals and “resolutions” (which most people make at the start of every year). Did you make New Year’s resolutions? If so, are you on track to achieve those resolutions? Statistically speaking, the answer is probably ‘no’ since 9 out of 10 people don’t keep their New Year’s resolutions (so don’t feel so bad if you aren’t on track). 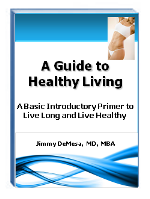 [NOTE: if one of your resolutions was to lose weight (as it is for many people) or to be healthier and more fit, then make sure to get my ebook, A Guide to Healthy Living by clicking on the "Download Now" button to the right to get it immediately for only $1.99. It will start you on a path to better health, achieving your ideal weight, and getting to a higher level of fitness. And, if you are on chronic medications, it will show you how you can possibly eliminate those drugs from your life]. You can also get this great ebook free, along with 2 other books (including a FREE autographed copy of my best-selling book, BeHappy! sent to your home or office) by clicking here. Now, though, what about goals? Did you set 1-year, 5-year, and 10-year goals for your life? If not, click here now to learn more about goal-setting (and achievement). Is a multi-millionaire business executive more "successful" (and, therefore, happier) than a working mother of two who is barely able to make ends meet? Maybe. Maybe not. For one person, success (and happiness) may mean significant business accomplishment while for another person success requires mostly a strong spiritual connection. Some people define success (at least partially) as having a yacht, a mansion, and the ability to travel the world. For someone else success might mean outstanding physical achievements (like winning a gold medal at the Olympics) while for yet another person, success requires only a few strong interpersonal relationships. Knowing what success means to you, though, starts first with your personal "Definition of Happiness". Click on the "Get Instant Access" button below to find out your "Definition of Happiness" quickly (and get two free ebooks as a gift from me). Then, keep reading more about success and happiness below. As stated previously, much of whether you are “successful” or not depends on your personal "Definition of Happiness" and your individual definition of success. We can achieve great "success" in several areas, but if these areas don't make us happy, then we may not really be successful. It's the reason some very accomplished (successful) actors, musicians, sports stars, and other “celebrities” are so miserable. It's because they may not really be happy. Again, the reason for this is mainly because (a) they have never defined happiness for themselves (which is the case for most people) and, therefore, they don't really know what would make them truly happy or (b) they have defined happiness clearly for themselves, but they have not yet achieved all the requirements for that "Definition of Happiness" fully. In other words, in this "celebrity" example, there is more to their "Definition of Happiness" than just fame and fortune (which is nearly always the case). The second meaning of the above statement that "to be truly successful you must be truly happy" relates to the abundance of research which shows that happy people make more money, are healthier, have better relationships, and even live longer than unhappy people. In very simple terms, therefore, happy people are more "successful" than unhappy people (not the other way around). It's really that simple (not easy, but simple). The key here, then, is this: if you want to be really successful, you must be happy! By being happy, you will have a better chance of achieving your goals and meeting your personal requirements for success - whatever that means to you. Again, though, to really be happy, you still have to go to point number 1 above, which is to define happiness clearly for yourself. It's really the foundation of life. To achieve the success you want in your life, therefore, read on for the actions to take for the next 60 days to make “success” (and happiness) a reality for you. Take these actions over the next sixty days and by the time you receive the next edition of the BeHappy! Newsletter (in May), you will have made great strides toward a happier and more fulfilled life. 2. Using the "Definition of Happiness" you discovered by clicking on the button above (which could take you a few days since it's not always easy), next, define what success means to you (physically, financially, mentally, and spiritually). Take each of the 4 categories I just mentioned (or create whatever categories make sense for you based on your personal "Definition of Happiness") and create a list of accomplishments, achievements, goals, wants, desires, and needs for your life that would make up "success" in your life. For example, if your "Definition of Happiness" includes living a lifestyle that requires a higher level of income than you currently have, then brainstorm on how "financial success" would look for you. Make sure it is consistent with your "Definition of Happiness", though. Everything has to match up or it's unlikely that you will be both happy and successful. 3. Create a Happiness Plan for your life (click here to get a free "Happiness Plan" template I've developed --- and if you get the free autographed copy of my book, it will explain everything you need to complete that “Happiness Plan” for your life, too). 4. Monitor your happiness and your success regularly and frequently: Set up a system, perhaps in your cell phone or tablet, to remind you to check certain things about your "Definition of Happiness", your success, and your overall "Happiness Plan". You can have reminders set weekly, monthly, and annually for various issues. The key starting point is to make sure to define happiness clearly and completely for yourself. Then do whatever you need to do to truly be happy. This is the only way to really achieve success in life. Take these actions now and use the information over the next 60 days to become as successful as you can be in life. You can also check out some of the great resources below to help you get the success and happiness you want. A whole new "look and feel" will be coming to BeHappy101.com in 2015, so be on the lookout for some great changes to the website over the next few months. I think you'll like it.